Chicken Paprikash is a classic comfort meal that originates from Hungary. 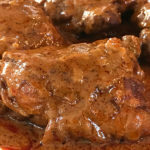 It is actually considered a stew, as large chunks of bone in chicken thighs and legs are submerged in thickened liquid. 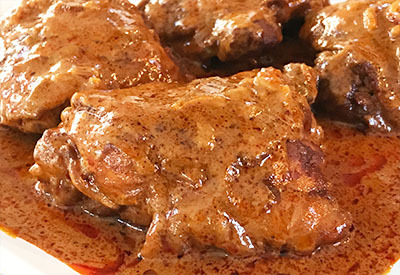 Chicken Paprikash ready to be served with rice, noodles or bread. Of course, as the name suggests, the liquid is flavored with a healthy dose of the spice Paprika. Did you know that there are several different varieties of Paprika, and they are not all the same? Paprika is a spice derived from peppers. Hungarian Paprika – commonly known as sweet paprika. And just like there are a plethora of peppers ranging from sweet to blazing hot, Paprika powder reflects the same diversity. The standard Paprika that you find in an American grocery store, you know, the one that just says Paprika on the label, is a very bland variety producing little flavor. It is most commonly used as a garnish or a color enhancer. If you look further into your grocery aisle, you might find a couple of other Paprika varieties: Spanish Paprika and Hungarian Paprika. 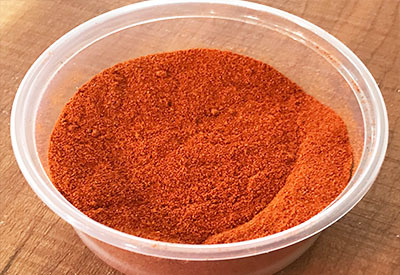 Although both varieties have a wide range of Paprika flavors in their country of origin, in the common American grocery store Spanish Paprika tends to have a smoky flavor with a moderate heat level. Hungarian Paprika has a complex depth of pepper flavor that tends to be sweeter than its counterparts. 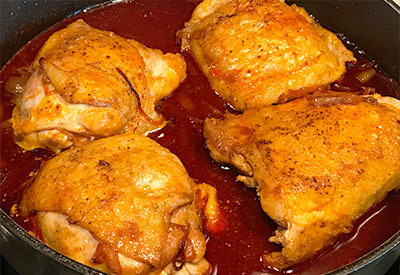 True Chicken Paprikash recipes require you to use sweet Hungarian Paprika to produce the sweet sauce that your chicken will absorb. You can also add a sliced Anaheim pepper to this recipe to add another depth of flavor if you prefer. Just slice it up and add it when you saute your onions. Be sure to temper the sour cream to prevent curdling. Be sure to temper your sour cream before adding it to your sauce. If you add cold sour cream to the hot liquid it will curdle. Just scoop a spoonful of the hot liquid in the sour cream and stir constantly. This will slowly increase the temperature so that it can safely be added to your mixture. Brown the chicken on both sides before simmering in the liquid. A Hungarian dish composed of fall apart chicken that is lathered in a sweet aromatic sauce and screams comfort food at its finest. Sprinkle the chicken with salt and pepper on both sides. In a heavy duty pot over medium-high heat, melt the butter and coat the bottom of the pot. Add chicken pieces in a single layer being careful not to overcrowd the pan, working in batches if needed. Brown the chicken on one side for 5-7 minutes, and then flip over and brown the other side. Repeat until all chicken has been browned on both sides. Transfer the chicken to a plate and cover. 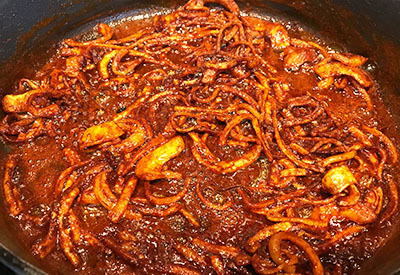 Add the onions to the pan, stirring frequently until the onions are caramelized. Add the paprika, stirring constantly for 30 seconds, being careful not to burn the paprika. Add the chicken stock and salt and then return the chicken pieces back to the pot along with any juices left on the plate. Bring to a boil, and turn heat down to maintain a gentle simmer. Cover and cook at a low simmer for 45 minutes. Whisk together the flour and sour cream until smooth and set aside. 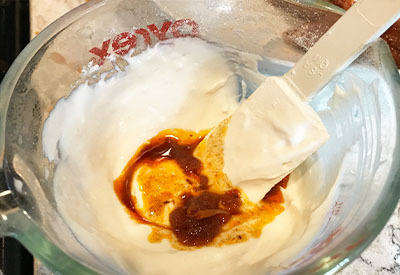 Temper the sour cream by transferring a spoonful of hot cooking liquid from pan to the cream mixture and stir. Repeat 2 more times. Pour the sour cream mixture into the pot and stir to combine until thickened. Serve alone as a main dish or over noodles, mashed potatoes or rice. Recipe provided by Make Your Meals.